I meant to come along on Friday and post my good news. I didnt. I got roped into an extended shopping trip at Toys R Us where my little guy ended up with a Cozy Coupe and a plastic slide. All to use IN the house, as I do not have a backyard. *_* Ah yes, the joys of parenting. So here I am today, with a mashup of info and my good news. First up: I am a Steampunk enthusiast. I love the style, I love the era, I love the possibilities. I am loathe to find that it is often NOT done justice. I do however have high hopes for this. Thanks to http://www.scifiguy.ca/ for the heads up! OMG. First of all, that cover is STUNNING. Secondly, one of the YA authors I’m kinda obsessed with (Maria V. Snyder, whose Glass series I’m currently working on), is contributing a story. Along with a few other heavy hitters. Ann Aguirre. Caitlin Kittredge. Et al. I’m beyond excited. And I’m going to get it, if only to support the steampunk love. 🙂 Look for it in May 2011. Speaking of beautiful covers- ok, I can’t wait. Check it out! I have a brand new shiny to share with all of you. I just received the cover to the second book of my Guardian Circle Series, Zerah’s Offering. I LOVE it. The color, the mood, everything. The heroine is Amaya, the empath from book 1. And Zerah is a very different place than you remember it! Look out for book two coming sometime in November. 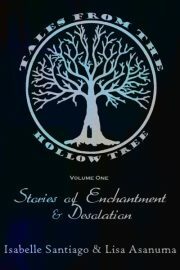 And look out for exclusive excerpts and giveaways here on Hollow Tree! Jackson Pearce is doing a thirty days of vlogs feature on her blog. The topics are everything and anything (no seriously, mythbusters and the proper wearing of wigs all make an appearance). And although it may not be a movie persay, it is most certainly entertaining. Go check her out, especially her post today about book pirates (there’s a puppet!). She makes me want to vlog, if only to see what a certified disaster it would be.